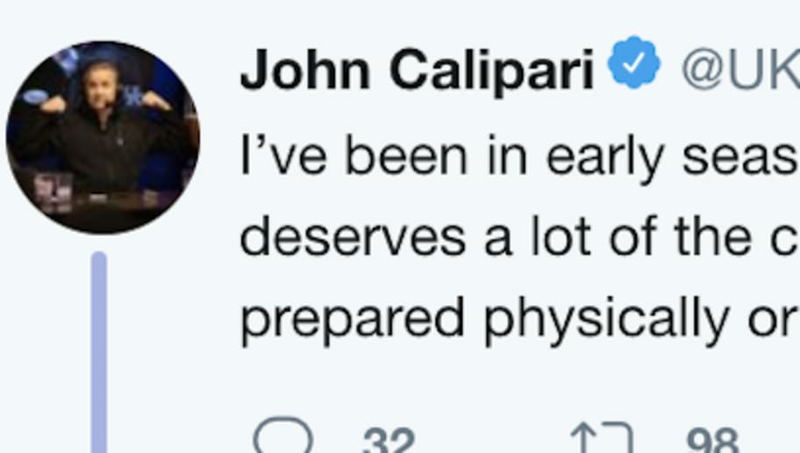 Kentucky may have been absolutely destroyed by the ​Duke Blue Devils last night, but coach John Calipari ​had a humble message for Kentucky fans in the wake of their loss. I’ve been in early season games like this one and been on both sides. Duke deserves a lot of the credit. They were outstanding. Having said that, we weren’t prepared physically or mentally as I thought we would be, and that’s on me. ​​Coach Calipari is certainly right about one thing: it's early in the ​season. The Wildcats can surely bounce back from this loss, though it has to sting quite a bit. Freshmen ​Zion Williamson and R.J. Barrett put on an absolute clinic against the Wildcats, collectively dropping 61 points on them. Is Duke really that good? Or was Kentucky just unprepared? I can assure you this has humbled our team and our staff. I can also assure you that I wouldn’t trade this team for anyone and I can’t wait until we start clicking collectively. Calipari believes that the team will be humbled by the loss. Hopefully, it can light a fire under them and help them make some quick improvements. We're excited to see how these teams develop as the season moves forward. Was last night just a common blowout, or does it point to some larger issues for Kentucky? ​​We'll just have to wait and see how Calipari and the Wildcats respond from here.